For my next few posts, I'm going to focus on life skills, or functional skills, programs. I write a lot about functional skills on the blog. And one of my main focus in products and writing is always how to make our instruction functional. Key Takeaway: Anything that makes an individual more functional in their life is a functional life skill. But what does functional mean? Functional means the student can use the skill after it is mastered to improve his or her life. It is a skill that leads the student to a destination of more independence, the next academic setting, future learning, or employment. What are life skills? Interesting life skills can be used to refer to a functional curriculum focused on employment, independent self-care and other transition skills. It also is sometimes used to describe a program that focuses on specific, explicit instruction of daily living skills. Really, life skills can mean a lot of things from a college student who needs to learn to do her own laundry to an adult with disabilities who needs to learn to dress independently. So, I titled this post "functional life skills" because I want to talk about programs that achieve both skills. And I don't think that life skills need to be limited to self-care and domestic skills. Anything that makes an individual more functional in their life is a functional life skill. Nonetheless, there are a lot of misunderstandings and myths that have developed over the years about these concepts. So, I want to tackle 5 of them today and set the record straight. He's Too Young to Work on Functional Skills! 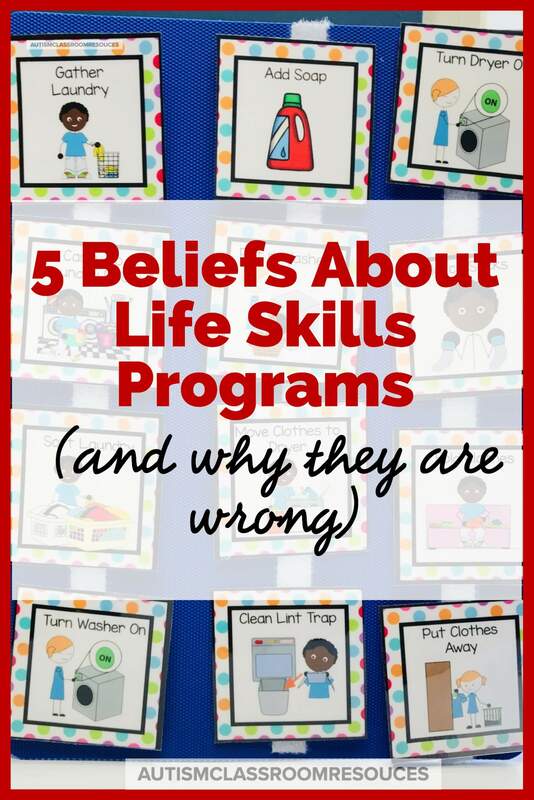 All students benefit from learning life skills in a functional way. But, not all students need explicit instruction to learn them. Typical students learn by imitating. One of the play skills we see in toddlers and 3 to 5 year olds are imitating life skills of their caregivers. They pretend to sweep, and cook, and lots of other daily living skills. Many of our students with significant disabilities miss this phase and don't learn effectively by watching a few times. They need more explicit instruction. So it's never too early to start teaching life skills in a functional way. It certainly does not mean it's all we teach. However, we can teach those skills explicitly alongside other academic skills we are teaching. And we can actually make some of our academic instruction MORE functional and meaningful by teaching and using the skills in a functional way. This misconception stems from the idea that programs have be all or none. They are either academic or functional. That's not the case. In fact, strong instructional programs focuses on both the academics and the practical application of the academics. And for some of our students, skills for how to dress themselves, care for themselves, and manage in the community are going to be just as important as reading and social studies. However, since it's not an either /or proposition, we should think about how to combine the two for students who need explicit instruction in both. We should always ask...how can I make this reading activity functional for this student? That doesn't mean we only teach him sight words and signs. Instead, it might mean thinking about all the different ways he might use reading in environment. For instance, students need to read the web to gather information. We all need to read recipes, and the news, and letters (or at least emails) that come with information in them. We also need to introduce students to reading for leisure...which is where fiction comes in. And to gather information and understand all they have read is going to be a crucial skill in all this. So don't limit yourself to being a "life skills" program or an "academic" program. Be creative and combine the two to make it a functional application of the skills. I have a post that talks about this process in teaching content-standards that might be helpful in jump-starting this effort. We should always ask...how can I make this academic activity functional for this student? This might be the issue I hear most often and the issue that is most off target. First, "high functioning" is in quotes because I don't really know what that means. People throw that term around (including me) and I've found that everyone kind of has a different definition. However, this is something I see frequently in the autism community. If a student is on the general education standards, we tend to forget that he or she might still need explicit instruction in taking care of themselves. These are the biggest issues that face those students when they leave high school. Let's face it...most of our students can do the work of a job or we can train them to do the job itself. It's soft skills like social skills, independence, and self-monitoring that tend to get them in trouble. Life skills and functional skills are part of teaching a student to be independent. Tailoring the instruction to the needs of the individual student is critical. However, that doesn't mean that we can wait for a problem to arise to teach the skill. For instance, if a student can't do his laundry or dress himself...we don't always know this at school. And yet school is the best equipped place to teach new skills for many of our students (more of that in #5). We can't always wait for a problem to arise because we may not ever see it. Instead, we need to have a programatic curriculum that shows us the skills that a student should have upon graduation to be successful. Something like these 4 curricula I described might be suitable. We need to be proactive in our teaching to prepare our students for life. This is one that maybe I'm biased about because I'm the sibling of an individual with autism. And given our age, most of her functional skills were definitely taught at home by my mother. Some of my earlier memories were of riding in the car with my mother following the city bus to make sure that my sister knew how to make a transfer without getting lost or panicking. Now, my mother was trained to be a teacher...it's what she did before she had kids of her own. And I come from a family of teachers. That isn't the case for most of our students. There are a ton of issues with trying to teach new skills at home that probably warrant their own post. Home is not as structured, so it's harder to set up. There are emotional overlays that make consistency in instruction really difficult. For instance, I will tell you that teaching life skills to my sister meant my mother was ALWAYS the teacher and their relationship suffered because of it. Finally, I can guarantee you that you have more than one student in your classroom who will perform skills for you that he will never do for his mother. I'm not saying that some instruction in life skills shouldn't and couldn't be done at home. And I certainly don't mean to imply that the school has to be responsible for all of it. But we do need to partner with our families to help them generalize skills that we might introduce in our classroom. We can't expect our students, whom we, as trained professionals, struggle with to teach new skills at times, to learn naturally from their parents' instructions on all skills. Those are just some thoughts from my chair about functional life skills. We have been talking about them in the Academy this month and have a workshop on planning functional skills and another (upcoming) on using ABA to instruction functional life skills. So, if you are looking for ideas, think about joining us! You can find more information here.